"We have to stop treating this like it's exactly the same as last time." 22 Jump Street is an action/comedy sequel which satirizes action/comedy sequels, and it's written with just the right amount of intelligence and self-awareness to be satirical without losing its grip on reality. It's an attack on Hollywood's lack of creativity which understands it has to also do its own thing to be worth watching. It's easy enough to poke fun, but directors Phil Lord and Christopher Miller manage to do it while maintaining and building on the magic of the previous installment. 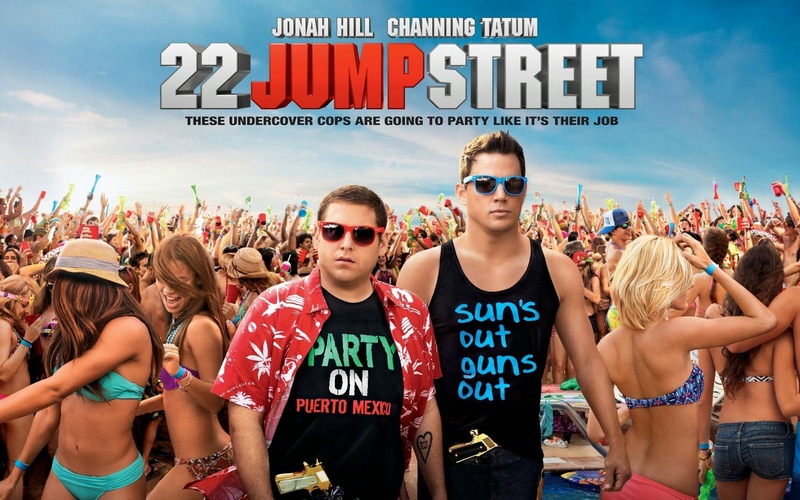 After the successful mission in 21 Jump Street, undercover officers Schmidt (Jonah Hill) and Jenko (Channing Tatum) have had trouble finding their groove with traditional police work. Deputy Chief Hardy (Nick Offerman) decides to send them on a new mission: do exactly the same thing as last time. The only difference? Now they're doing it in college rather than high school. Like 21 before it, 22 succeeds largely based on the wonderful chemistry between Hill and Tatum. The two play up the bromance of the situation, so that a scene where they decide to "investigate different people" plays out like a couple breaking up. It's the kind of film that forces you to speculate about the duo's friendship in real life, because they must be great friends to get along on screen as well as they do. With this foundation firmly established, Lord and Miller build up their critique of Hollywood on top of it. There's a running joke that the solution to all their problems is to do it exactly the same way as they did last time. "Infiltrate the dealer, find the supplier." But eventually it becomes clear that doing the same thing won't be enough. Every case (just like every movie) is different, and needs to be treated as its own entity or it will be doomed to fail. The allegory to Hollywood's crisis in content creation is obvious, but it still works well. Sequels, remakes, reboots; whatever it is, it needs to be its own thing, not just more of the same. 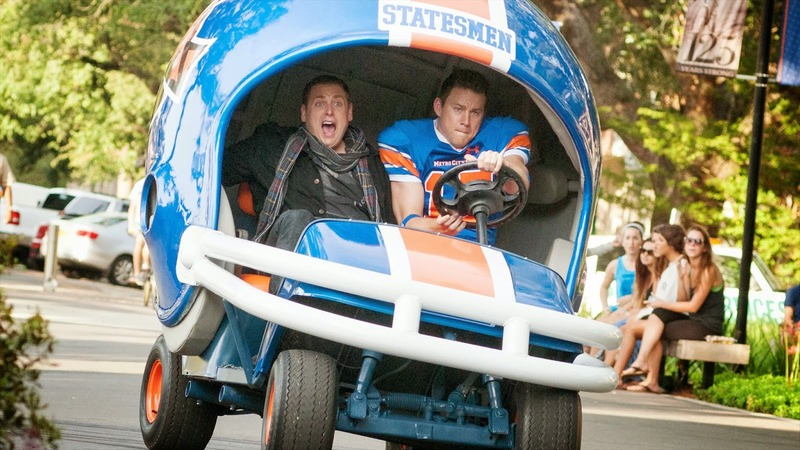 There are also quite a few fun new elements which make 22 Jump Street more than just another outing with Hill and Tatum. Jillian Bell gives a hilarious supporting performance as Mercedes, the unseen but all-seeing roommate of Schmidt's new crush. There's a running joke about stand-up comedy versus improv, and the way it plays out managed to make someone as anti-improv as myself question my assumptions about the nature of comedy. There are also some great jokes ranging from a high school football team called the Plainview Red Herrings to a car chase in which the characters try to avoid destroying expensive stuff because their budget is running out. There are even some creative editing decisions involving split screen and montage which make the film enjoyable from a technical standpoint as well. As much fun as it was, and as much as I wouldn't mind seeing it again, I'd be lying if I said I wasn't expecting just a little bit more though. The critique of Hollywood fades in and out at times, and ironically it doesn't seem to have been enough to discourage a third installment in the franchise. The story also sags a bit in the middle as the "same as last time" jokes begin to get tired, and it seems to lose its way when it tracks away from Hill and Tatum's relationship. But as far as comedies go, this is the smartest and most self-aware one I've seen in a long time, and anyone looking for a good laugh need look no further. I only wish Hollywood would take notice, because after his upcoming outings with the Coens and Watchowskis my handsome hero is scheduled for nothing but sequels and reboots for the next two years.